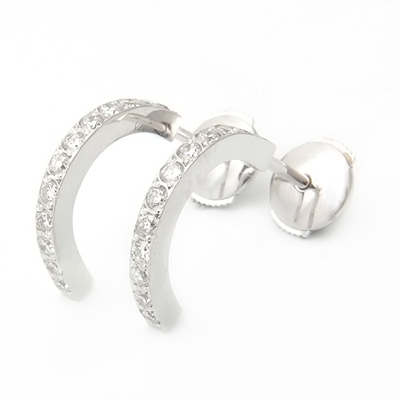 Platinum Half Hoop Diamond Earrings — Form Bespoke Jewellers Ltd.
A elegant pair of platinum half hoop diamond earrings. Designed alongside our expert jewellers at Form Bespoke Jewellers, the customer chose to have these diamond set earrings cast in platinum. Each half hoop earring boasts 12 round brilliant cut diamonds of matching colour and clarity. Simple and sophisticated, these platinum half hoop earrings are real sparklers.